WASHINGTON—A new report shows that China isn’t just copying technology, but also moving faster than the United States in innovation and in developing advanced technology industries. The U.S. think tank Information Technology and Innovation Foundation examined various areas in which China has made progress and closed the innovation gap with the United States in the past decade. The report uses 36 indicators in measuring Chinese performance and shows that China has closed the gap or, in some cases, even outstripped the United States. To become a global innovation leader, China is following the path of Asian tigers such as Japan and South Korea. The country made notable progress in the last decade in the areas of research and development (R&D), university performance, patents, entrepreneurial activity, industrial sales, and exports, according to the report. China, for example, increased its R&D investment significantly during the 10-year period. In 2007, the country invested $129 billion in R&D, which was 33 percent of the R&D spending in the United States. By 2017, the gap was reduced, reaching 76 percent of U.S. levels and surpassing the European Union, the report says. The number of U.S. patents issued to Chinese companies, which is an important indicator of innovation, also jumped in recent years. Nearly half of the patents granted by the U.S. Patent and Trademark Office each year go to foreign inventors. In 2006, the United States granted 1,066 patents to Chinese, which accounted for 1.2 percent of patents granted to U.S. inventors. By 2016, the number had risen to more than 11,000, which equaled 8 percent of U.S. patents. The study also highlights the role universities play in national innovation systems, as they produce skilled scientists and engineers as well as entrepreneurs and innovators. About 7 million students in China obtain a bachelor’s degree every year, with over 30 percent receiving an engineering degree, compared with just 5 percent in the United States. The report also finds that as a share of the population, China produces 46 percent more computer science and engineering degrees than the United States. China also is actively recruiting foreign engineers and scientists from other Asian countries and the United States by paying them very high salaries, all backed by government subsidies, according to the report. The development in Chinese high-tech manufacturing also provides insight into China’s innovation. For example, Chinese high-tech exports grew from 139 percent of U.S. levels in 2006 to 203 percent in 2016. And value-added—the measure of industry output minus inputs such as raw materials, energy, and so on—increased to 77 percent in 2016 from 30 percent in 2006. If the pace of growth continues, China will surpass the United States in high-tech manufacturing value added by 2020, the report indicates. In other sectors such as information and communication technology, semiconductors, chemicals, pharmaceuticals, high-speed rail, and aerospace, the report showed that China made dramatic progress relative to the United States in the past decade. The United States, however, had gained competencies and leadership in many sectors by investing trillions of dollars in R&D, workforce training, and other areas in order to innovate complex products, according to the report. “The Chinese government knows that if it proceeds the fair and ‘natural’ way that it will take it many decades or more to seriously close the innovation gap with the global leaders,” said the report. Hence, it resorts to various policies to obtain the know-how it needs from foreign companies, such as theft of intellectual property, forced joint ventures and technology transfer, and state-subsidized acquisition of foreign advanced industry firms. 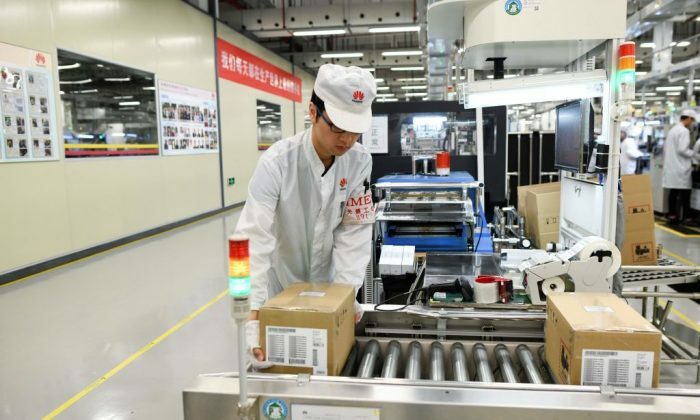 If China rapidly evolves from a copier to innovator, however, the negative impact on advanced economies will be big because the Chinese economy is massive and it’s much more difficult to get China to compete fairly, according to the report. The loss of leadership in innovation and technology has two implications for advanced economies. The first is that it reduces prosperity and living standards. The second factor relates to national security and the defense industrial base, which is a significant problem for the United States, as its defense superiority is driven largely by technological superiority, the report says.